Submitted by mahoney on Mon, 04/07/2008 - 3:52pm. K-Mart Department Stores across the USA including Hawaii...Kmart (often spelled as "K-Mart") is a chain of department stores in the United States, Puerto Rico, the U.S. Virgin Islands, and Guam. The chain merged with Sears in 2005, creating the Sears Holdings Corporation. 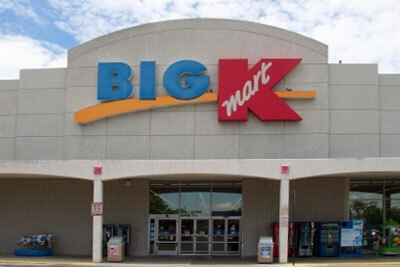 Kmart also exists in Australia and New Zealand (see Kmart Australia), although it now shares no current relation with the American stores except in name after US equity in the Australian business was purchased in the late 1970s. It is the third biggest discount store chain in the world, behind Wal-Mart and Target. All of these locations were taken from the official K-Mart website. The 21 locations outside of USA/Can, are in PR. Submitted the latest store listing as of January. Net decrease of 98 locations. Submitted a new listing. Decrease of 261 locations. Updated the file. Net decrease of 206 locations. Updated the file, Net decrease of 119 locations. Submitted corrected coordinates for the locations in East Stroudsburg,PA, Hummelstown,PA and Wind Gap,PA. Submitted corrected coordinates for 17 locations. Submitted 1 closed location and 5 closing soon locations. Removed from file. Submitted corrected coordinates for the location in Kissimmee,FL. Updated the file. Net decrease of 175 locations. Location in Winter Garden,FL has closed. Updated the file using the latest data from the website listing. Updated the file from the latest website locator listing. Reformatted the file and updated the file to the official website listing. Deleted 2 non-exisetent locations:2599 Middlesex Ave-South Plainfield-NJ. location and 63 Michael St-Piscataway-NJ location. Removed 2333 East South Blvd, Montgomery, Alabama, it has been closed. Deleted Texas locations that have closed.